Having read Ender’s Game and Ender’s Shadow years and years ago, I recently restarted the Ender’s Game series with Speaker for the Dead, and after enjoying it immensely, moved on to Xenocide. Orson Scott Card makes some bold moves in his writing, culminating in a thought-provoking discourse. Unfortunately, the story must suffer somewhat as a result. Despite any shortcomings of the work, this book should be read by anyone with a desire to think outside of the box in regards to science, religion, and humanity. A long time ago, I fell in love with the science fiction of Orson Scott Card when I first read Ender’s Game and Ender’s Shadow. I am not a professional writer or critic by any means, but I do fancy myself an amateur critical thinker with the ability to read between the lines and behind the text to come to a more intimate understanding of the author. This novel highlights the internal dialogue inside Scott’s mind as he explores the metaphysical boundaries of the universe and the struggle of individuals, organizations, and humanity to coexist with “foreigners”. This may be personal bias, but I love books that explore cultures and world views other than western. Given my American upbringing, I feel we as a people lack an appropriate appreciation for other cultures, especially eastern-based ones. Those that go through life without coming to know a true “easterner” may incorrectly assume that humanity is more homogenous than they actually are. Coming to know a different culture helps one recognize their own idiosyncratic ways as well as break down preconceptions of how one can live. Without spoiling the meat of the content, Card creates an environment and storyline that allows you to question the perception and acquisition of truth, the ability (or inability) for human natures to change, and the foundational physics of our existence. This is, I feel, is an internal debate that Card had within himself for many years of his life as he sought to understand his life beyond the assumptions of science and traditional religion. You as the reader have the opportunity to glimpse inside the soul of another human doing that which is most human: creating—Creating a story, creating a reality, creating a logic, and creating a meaning. Side Note: If you listen to the Audible audiobook, you will most likely thoroughly enjoy the talented voices behind the narration. I am particularly impressed by Stefan Rudnicki. While I admit I am an unabashed fan of Orson Scott Card, I do not think he is infallible in his work. The price of all this mind-blowing material comes in two forms: Excessive explanation and homogenous characters. In order to get these extraordinarily complex ideas past an editor and into the minds of younger individuals and the scientifically unordained, Card needed to spend a lot of time to set up the conversations that needed to occur between the characters. This can cause the book to drag along, which may be difficult for some readers to get through. If you think that’s you, get the audiobook to help move you through the dry parts. Sometimes it feels like Card is beating a dead horse with the infinitely recursive logic that keeps cropping up in the discussions and arguments between characters, but I imagine he does this to try and illustrate the difficulties in communicating ideas to those with completely different world views. 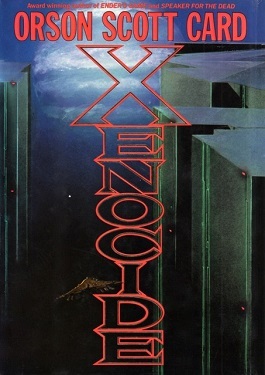 Even though his characters’ perspectives are diverse, the conversations in Xenocide are a little too homogenous, making it clearly apparent that only one person wrote this book. I am not saying it was horrible, but I had a hard time swallowing how there were so many geniuses yet so little variation in the intellectual approaches of each character. If you enjoy a novel that makes you think and can move through redundancies or a dragging story, then this book is for you. You will want to give yourself time to digest all the thoughts and feelings that Xenocide will inspire. Don’t read this book if you are looking for something easy to understand, average amounts of dialogue, or a fast-moving story.